IMLIL - TIZI n'TAMATERT - AMGHEDOUL - TACHEDDIRT - TIGHOURINE - IMLIL.Setting out along a piste for a hike towards the east up to the Tizi n'Tamatert (2272m) and on through fields of wheat and orchards of walnut, apple and cherry trees until you reach the village of Tamatert (1810m). 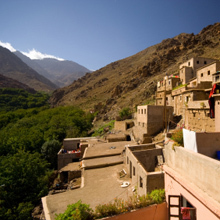 Once through the village take a path which then leads up through pine and juniper woods; stop at the Tizi to admire the Imlil and Imenane Valleys, the latter with its many terraced Berber villages tucked precariously on to the slopes stretching around you. All along with Adrar n'Oukaimeden (3268m), almost as high as the Rockies, on the southern horizon, with the high peaks of the Tizi n'Eddi (2928m) and the Jbel Angour (3616m) also looming down. 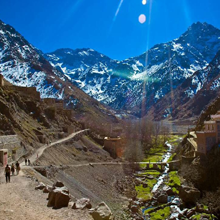 Continue the hike along the Tamatert Valley slopes until you reach the location for your field picnic at Amghedoul, surrounded now on all sides by the Toubkal Massif range. 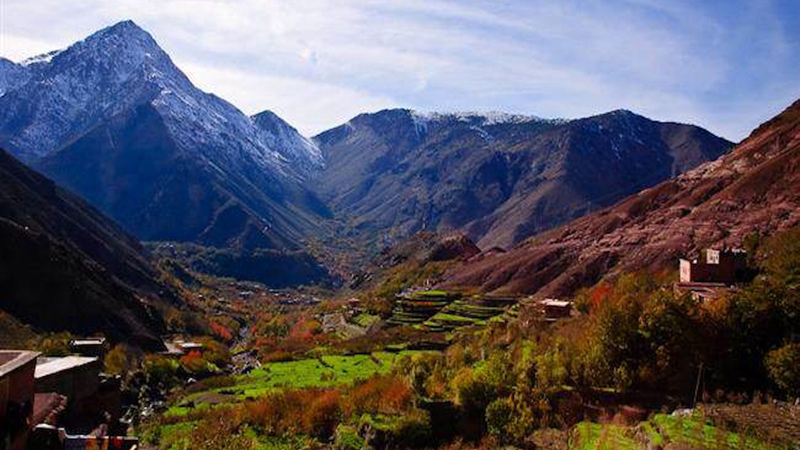 Once refreshed, set off back to the Douar Samra, first towards the oldest Berber village in this once-remote area, Tacheddirt, then via Ouaneskra and the other side of the Valley, passing through the villages of Tamegguist and Tinghourine with the stark Jbel Bou Iguenouane (3882m), Tizi n'Likemt (3615m), Aksoual (3842m) and the Azrou n'Tamadot (3664m) until a welcoming return to your accommodation. Guided walk ( 1 to 5hours) depending of your choice. 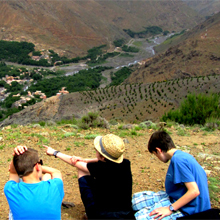 This Day trek runs all year round and can depart at any date of your preference. How to Confirm this Tour? Let us know the exacte dates for the tour? this will be discussed by email before you send the deposit. Let us know your accommodation details for the pick up? 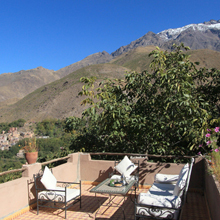 address & tel if you are staying in a Riad / Hotel? this can be whenever available and should be send by email at latest 12hours before departure.